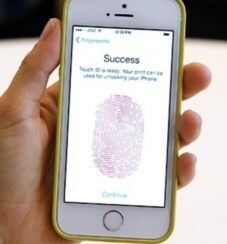 iPhone 5S: Hackers Breached The Touch Sensor ID, Hackers Crack Apple’s Fingerprint Scanner: A group of hackers known as Chaos Computer Club (CCC) based in Berlin, has announced that it has successfully carried out the hacking of the touch sensor reading fingerprints. To work around this authentication system, would use the laser in order to reproduce fingerprints false, a technology developed in 2004, to which it has been modified for this purpose. The hackers claim that in reality the Touch sensor ID has only a resolution maggioe compared to other solutions seen so far, so it is sufficient to increase the resolution of laser printing to remedy the problem. First, the fingerprint of the user’s writing is photographed with a resolution of 2400 dpi. The resulting image is then cleaned, reversed and laser-printed at 1200 dpi on transparent sheet with toner for setting the thickness. Finally, the latex milk pink or white comes out in the model created by the toner on the paper transparent. The layer of thin latex is lifted from the paper, moistened and placed on the sensor to unlock the phone. This process has been used with minor variations and improvements with the vast majority of fingerprint sensors on the market. The group also posted a video on Youtube showing the release of the terminal using a false digital printed.